My role as a physician is to provide the highest level of dermatological care for our region. I also feel we have a mission to educate the community on the importance of annual skin exams and how vital they are in early detection and skin cancer treatment. In my work as a Mohs surgeon and dermatopathologist, I am constantly reminded of how very important it is that a patient sees a dermatologist as soon as he or she notices any suspicious or changing moles. Jeffrey Blake Stricker, DO, MBA, CPE, FCAP, joined Dermatology Specialists of Alabama in 2015, bringing with him extensive experience in Mohs micrographic surgery and non-surgical superficial radiotherapy for the treatment of skin cancer. As a board-certified dermatologist and dermatopathologist, he specializes treatments for chronic and acute skin conditions, including excisional skin surgery, laser surgery, photodyanamic therapy, dermatologic immunology, sclerotherapy, and cosmetic dermatology procedures. Dr. Stricker received his medical degree from Michigan State University’s College of Osteopathic Medicine. After attaining his degree, he completed his internship in internal medicine at Genesys Regional Medical Center and residency in pathology at Texas A&M University College of Medicine’s Scott and White Memorial Hospital. Dr. Stricker completed two dermatological fellowships in dermatopathology at University of Texas Southwestern Medical Center at Dallas, and the second in dermatology and Mohs surgery at the Skin Cancer and Cosmetic Dermatology Center in Dalton, Georgia. Dr. Stricker also participates in continual training in laser surgery and Mohs micrographic surgery with programs from the American Society of Laser Medicine and Surgery, and the American Society of Mohs Surgery. 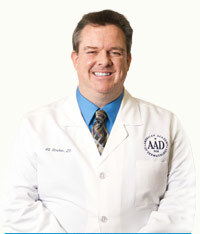 Dr. Stricker is a founding member of the American Board of Administrative Medicine, a past chair for the American Osteopathic Board of Pathology, and has served as assistant professor of dermatology at the University of Central Florida and as adjunct clinical professor at Lincoln Memorial University DeBusk College of Osteopathic Medicine.